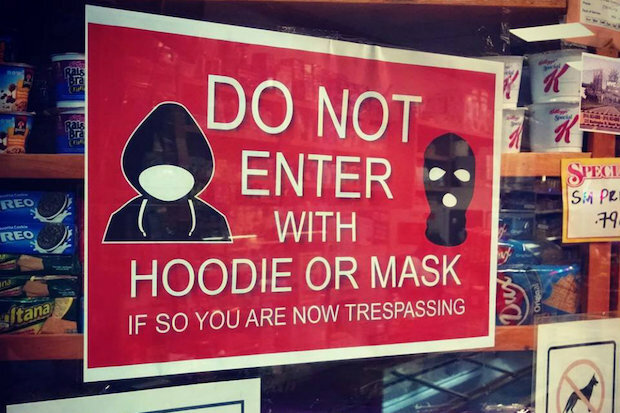 HARLEM — Neighborhood shops are making it clear that customers wearing hooded sweatshirts or masks are not welcome. "DO NOT ENTER WITH HOODIE OR MASK" read signs posted on three businesses along Frederick Douglass Boulevard, between 126th and 129th streets, warning "IF SO YOU ARE NOW TRESPASSING." While businesses see them as a way to stop shoplifting, some residents say the signs are offensive. The mastermind behind the signs is Joe Stark, a Philadelphia man who said he is in the process of launching his own security company. He said the $10 signs are meant to be a form of crime prevention, not discrimination. Stark has been approaching bodegas, restaurants, supermarkets and other businesses in New York City, Philadelphia, Baltimore and Washington, D.C. He estimated that he's sold a couple thousand of the signs. “The only complaint you might have is from the little thugs selling drugs in the corner,” he said. The signs have come under scrutiny from some customers in Harlem. The signs at Kings Deli and Bravo Supermarket got more than a few raised eyebrows from customers. Neither business has stopped hoodie-clad people from entering, but have stopped people wearing masks. "No hoodie is extreme but no mask is good," said Ali Haaj, a manager at Kings Deli. "Everybody complains about it." Despite the complaints, managers from both stores said the sign does more good than harm. But the signs send out the wrong message, especially in locally owned stores, said Harlem resident Tyquan Haskins. None of the six businesses that have the signs have charged hoodie-wearing customers with trespassing, staff said, and it is unlikely they could even if they wanted to, said local criminal attorney Charles Ross. Stark said he consulted his wife, who is an attorney, while making the signs. Wearing a hoodie into a store would become trespassing if an employee asks the person to remove the hood or leave and that person refuses, he said. He is considering adding the word “please” to the sign.